February 06, 2019, 6:30 p.m. 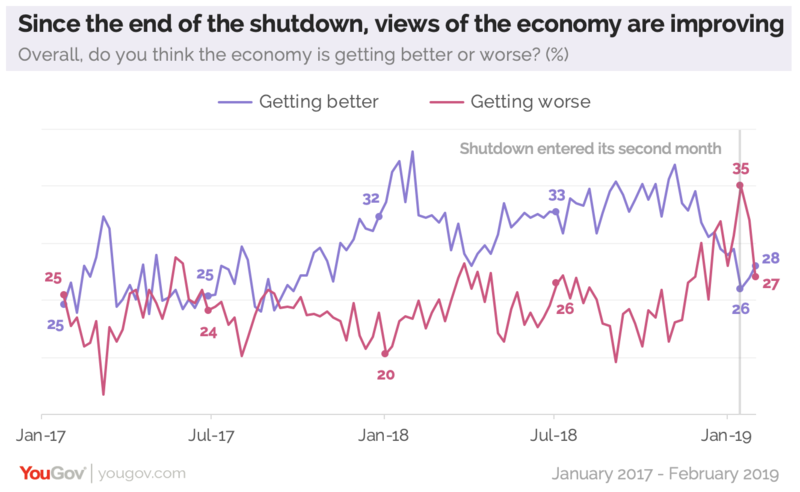 The 35-day partial government shutdown brought with it public concern about the economy, including the most negative assessment of where the economy was headed since President Trump took office. But the shutdown’s end, along with last Friday’s jobs numbers, have brought economic assessments nearly back to where they were before the shutdown. In the latest Economist/YouGov Poll, the share of the public saying the economy is getting better is about the same as the share saying it is getting worse. Economic assessments remain partisan: two-thirds of Republicans think the economy is improving, nearly half of Democrats believe it is getting worse. The evaluation of the President’s handling of the economy has also bounced back into positive territory: 46% approve of his handling of this issue, 38% disapprove. However, even with the good jobs numbers, that perception could change with another shutdown – something that most Americans, no matter their party identification, expect will happen. 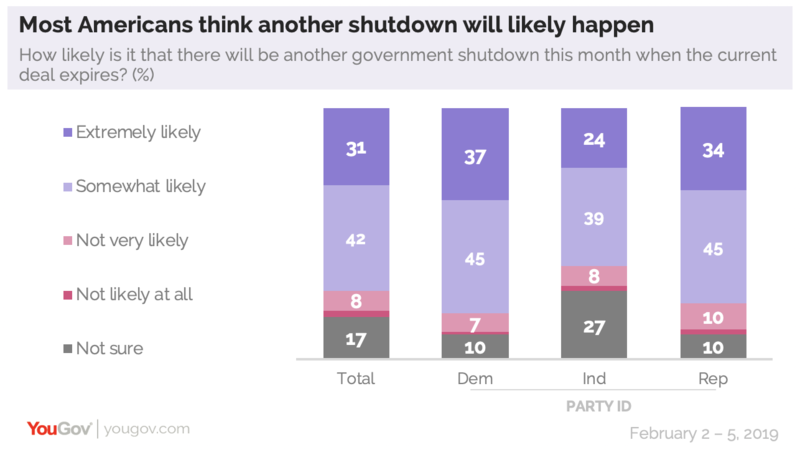 The pessimism is bipartisan, with about as many Republicans as Democrats believing another shutdown is likely. On a differently worded question – one that included reference to the conflict between the parties about constructing a wall on the US-Mexico border – there was another negative result. Here, 58% expect the government would shut down again, and only 14% say the President and Congressional parties will agree to a new deal. The public continues to be closely divided on the wall, with 40% in favor, and 45% opposed. Polarization is high: 82% of Republicans support building it, while 83% of Democrats oppose it. Two in three Republicans believe building a wall is the “only way to secure the US border with Mexico,” something only 5% of Democrats and 29% of independents agree with. During the shutdown, one compromise the President offered was to link border wall construction to three years of protection for those who entered the US illegally as young children. That proposal was rejected by Democrats. It may not go far enough for the public. By more than two to one, 59% to 24%, the public wants permanent protection and legal status for the “Dreamers.” So would 52% of Republicans. The Democrats in Congress were perceived as the victors at the shutdown’s end, and the President was held most responsible for the shutdown itself. If there is a new shutdown beginning February 15, it appears the latter could be true again – though there is a lot of blame to go around. 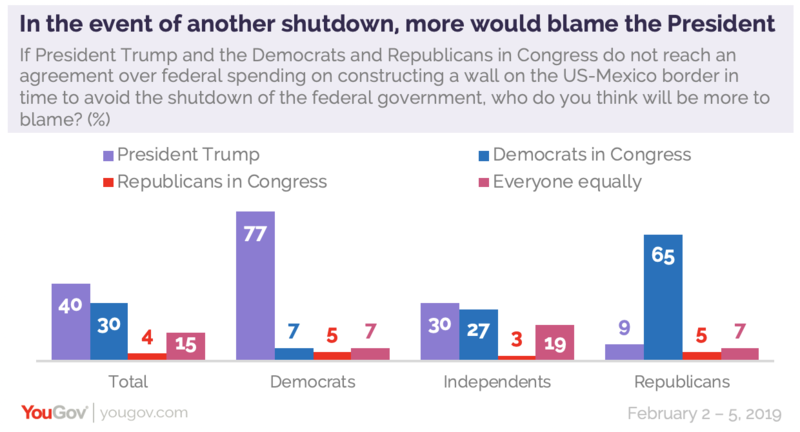 Four in ten would blame the President most if there is another shutdown, three in ten would hold the Democrats responsible. Another 15% would simply blame everyone equally. Americans reject the President declaring a national emergency at the border to find the funds to build a border wall. Although 30% support such a declaration, 52% oppose it. Republicans overwhelmingly side with the President: 62% of them think a national emergency should be declared to deal with the border, 22% of Republicans do not agree. There is potentially another concern when it comes to how Americans look at the economy – how they will be affected by the new tax law, a highlight of this Administration’s policies so far. The 2017 bill has never been very popular. 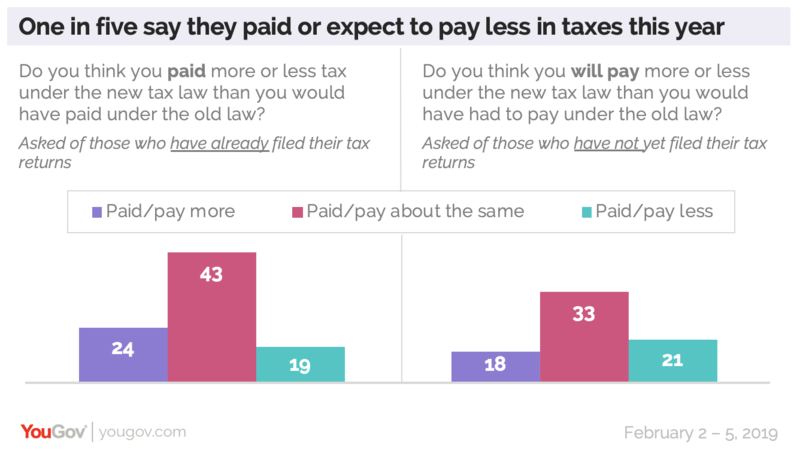 As has been the case from the very beginning, about as many Americans oppose the tax law (35% in this week’s poll) as support it (36%). As of the weekend, 14% said they had already filed their income taxes. What had they found? Only one in five said they paid less in taxes this year than the year before. Among those who had not yet filed, expectations for what they will pay are similar.